As most of you know, I moved into my first apartment about a week and a half ago. Even though I am living just a short drive away from my alma mater, adult life is definitely a change from the college dormitory lifestyle that I was used to. All the elements of my life have changed- definitely for the better! But still, change is change, and can be interesting to get used to. For example, take grocery shopping. In college, I looked forward to my weekly grocery runs in which I would solely purchase snack foods. Everything that I would come home with would just be foods to munch on during homework breaks or for midnight snacks. 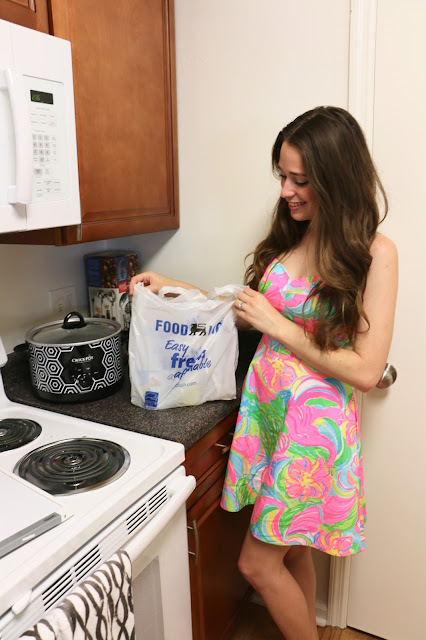 I never had a kitchen in college as I lived in dorms all four years, so my grocery lists were always quite simple! Now that I have an apartment, I'm not only still purchasing my wide array of favorite snack foods, but also fresh items such as meats and produce, and I also need to buy everything necessary to stock a pantry so that I can start cooking and baking- whew! Instacart, a grocery delivery service that is brand-new to Charlotte, came into my life at the perfect time for my adulthood transition period. Instacart is known for providing fast and reliable same-day grocery delivery service in the cities that they operate in, and they also work with as many grocery store chains in each location as they can (including both regional and national chains!). With many trips to the grocery store in my current future, I was so excited to get to try out Instacart for myself! The perfect day to test out the service came for me at the end of last week. 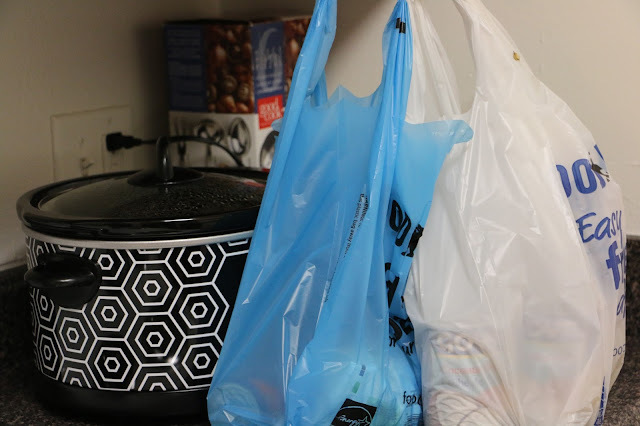 I visited a grocery store earlier in the day to stock up on some pantry items and some things that I needed for a recipe that I wanted to attempt that evening, but as to be expected, there were a couple items on my grocery list that I forgot. Several hours later, when I had already begun cooking the recipe, I realized what I had forgotten to get at the store, and knew that this was the perfect opportunity for my first Instacart order! I logged onto my account, selected which grocery store I wanted my items from, and placed an order. I was amazed that even in the evenings, delivery times were available within the hour! While my shopper was out purchasing my items, she had to make a substitution for something that I requested (they were out of name brand on a product so she had to purchase store brand). I was notified about the changes via text, and I loved being kept in the loop! My shopper arrived promptly and right to my door at the start of my expected delivery time, with all of my groceries in tow! I was able to finish my recipe without leaving my apartment, which was awesome! 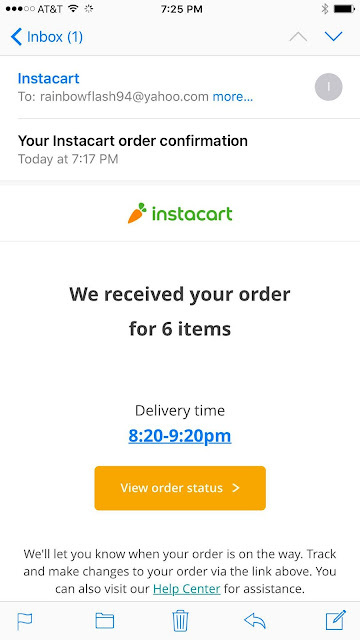 I was very impressed with my first Instacart experience, through and through. Instacart is currently available in cities all across the United States, and they continue to expand into new locations. They have generously sponsored a giveaway on Southern Belle in Training for one month's worth of free delivery service and a $50 credit to one lucky winner! This giveaway is open not only to Charlotte-based readers, but to anyone across the US who has access to Instacart in their city! Or if they haven't come to your location yet, then enter for an out-of-town friend- what a great gift this could be to another new college grad, or someone who has a very demanding work schedule and finds it hard to make time to grocery shop! P.S. More pictures of my apartment will be to come this summer on the blog! I am still very much in the early stages with decorating and still have a few boxes to unpack. But I do plan to share more once everything is set! Today's post was sponsored by Instacart. Thank-you for supporting the brands that support Southern Belle in Training! This sounds perfect! There are so many times that I needed to go grocery shopping (mainly at night) and am too scared to go out by myself #weenie. Thanks for sharing this with us! I just moved to Baltimore last week and found out about Instacart! I haven't tried it yet because the grocery store is only one block over, but it would be pretty cool to try! Nice to see they deliver so quickly. I LOVE this concept! A quick search let me know this type of service isn't in Hawaii yet, but I will be keeping an eye out! I dread going to the grocery store so I totally need to look into a service like this. I hope you're loving your new apartment! This sounds so awesome and convenient!! Thanks for sharing! I wish we had something like this around here!! There are always those moments when I am in the process of making something and realize I've forgotten a key ingredient! This would be so convenient! Congrats on your move! I definitely want to try Instacart. How handy is this! I wish we had something like that here. This is such a useful app! I hate going to the store when I just have one or two things to grab so the would be perfect. I am all about simplifying and this looks like the perfect app!! Thanks for sharing! Instacart is fantastic! I love the service they provide and it is so convenient that they bring it straight to me! how convenient! Thanks for sharing! I need to get on this ASAP – I despise grocery shopping! Wow how awesome is this! When I lived in Austin, Whole Foods HQ did something similar and it was a total lifesaver!